As a mother of three who made nine corporate moves in eighteen years, I can readily identify with the needs and concerns of busy families relocating. I am personally and professionally prepared to assist you and your family in making a smooth transition to your new location and your new home. 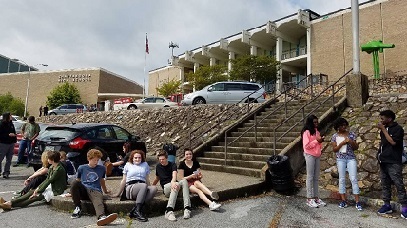 As a practicing real estate professional since the winter of 1996, I have closed more than half a billion dollars in home ownership moving to or relocating from the greater Chattanooga area. With the capable services of three licensed assistants and one professional field coordinator, I can effectively focus on your local or global relocation needs. I sincerely understand that you are buying or selling more than a home and am ready to meet your needs while making every effort to exceed your expectations in finding that new lifestyle while possibly making the investment of a lifetime. John and I want to sincerely thank you both for all the hard work you put into helping us find our first home. We were a little nervous but you made the process as seamless as possible and we truly adore where we ended up! 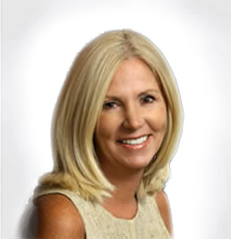 Linda Brock puts the client first and is an absolute expert in her field. We will use Linda again and would highly recommend her to anyone who is moving across the city or across the country. She got us the best deal, in the best amount of time, and is a PLEASURE to work with. Total pro. When we decided to sell our home, there was never a doubt who we would choose to be our realtor. Linda’s record speaks for itself but on top of that, we found her to be compassionate about our needs, so knowledgeable about what needed to be done to sell our home, and was so patient with us any time we had questions or worries. We can’t say enough good things about Linda Brock. Her work ethic is tops and with no doubt one of the hardest working people we have ever met. You definitely want her on your side. Linda Brock is the most competent and professional real estate agent my husband or I have ever worked with by far. She knew the market value of our home and priced it accordingly to sell. She gave us great advice on what to do to help the sell. She was always courteous and thoughtful of our needs. She advised us on her plans for selling our home and she followed through with every one of them. We highly recommend her to anyone wanting a great real estate agent who really cares about their clients and puts their needs first. She became a friend as well as an agent. Linda has helped us buy and sell two homes in Chattanooga over the last 13 years. She is extremely good at what she does, including pricing, negotiating, and finalizing the deals. She followed through with everyone to keep the closing on time and on track. 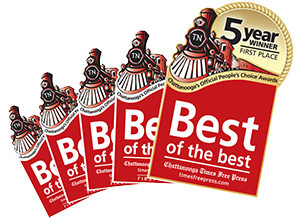 I would not hesitate to recommend Linda to anyone in the Chattanooga market. Linda was very easy to work with and she seemed very concerned about meeting our needs. She worked with our schedule so meeting with her at our time schedule was very helpful. She went far and beyond what we expected in an agent. She even reached out to buyers that had viewed the property months before. She also insured that the closing process went very smoothly for us. 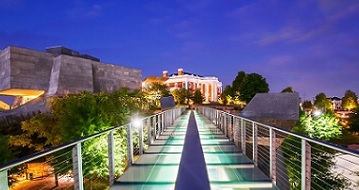 "Mary and I cannot express enough our thanks for all your help throughout the process of selecting our new home. When we were looking up realtors in Chattanooga to contact I remember telling Mary that Linda Brock's reviews are so good it sounds like people want to adopt her. Our experience has been that you are better than advertised. Your positive attitude, knowledge, and insight of the market proved invaluable throughout the process. As we just closed and we're excited to move into our new home I don't want to think about selling it, but working with you was such a pleasure that we hope to be able to do so again. Thank you, and your team, again for everything you do." Congrats! 20 years? Wow. What a great run and still on top! 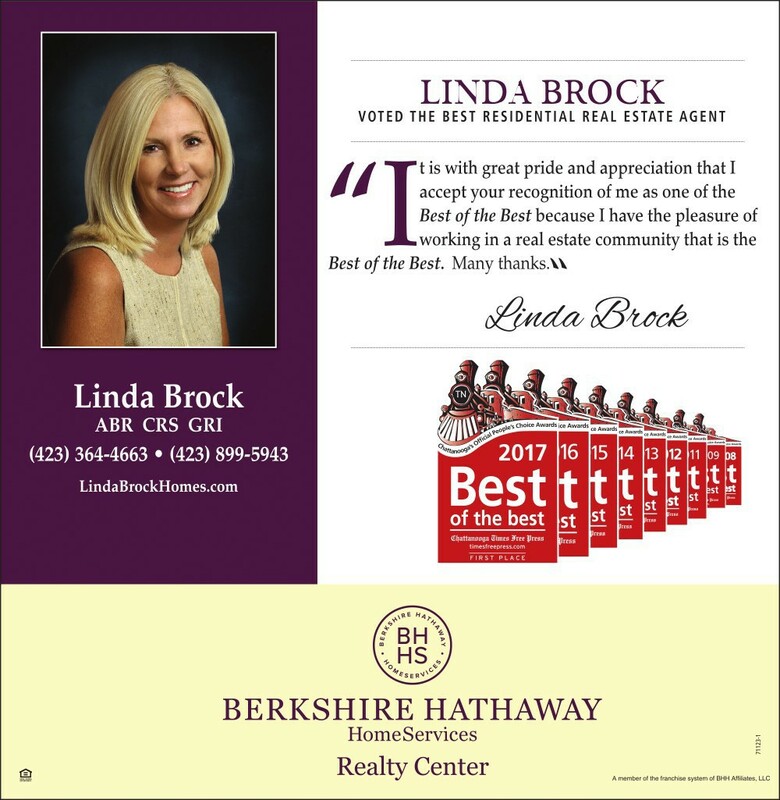 I love it when I see the company recognize its agents for their outstanding performance and YOU, Linda, deserve every accolade you receive – you truly are THE BEST!! CONGRATULATIONS! Thanks for all of your help in making this sale possible. It is easy to see why you and your team are Number 1. Wow!! We love you Linda! Thanks again for going way above and beyond! Thank you, Linda. 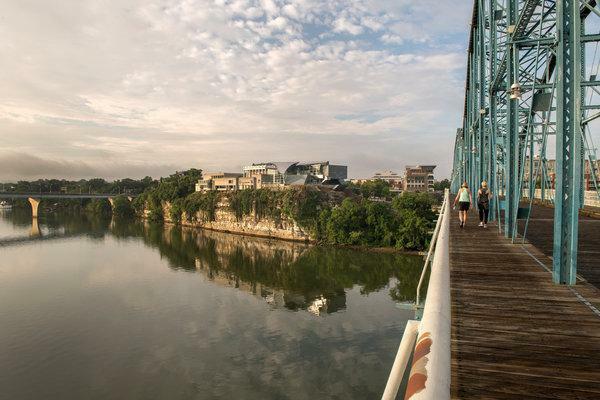 You have made our transition to Tennessee a smooth and comfortable one and we’re looking forward to moving into our beautiful home – thanks to you! Linda Brock is top 5 Berkshire agent in U.S. 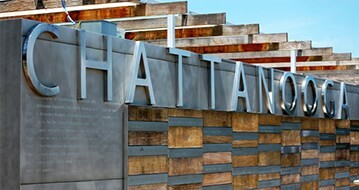 Kids prefer Chattanooga over Disney! !